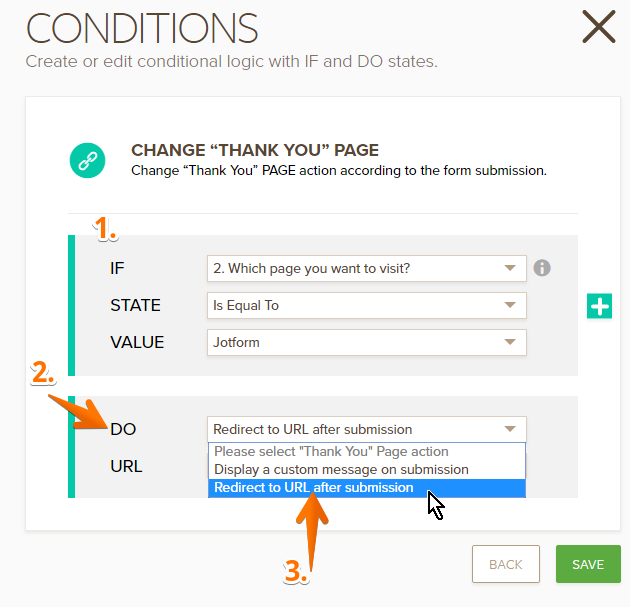 If you want to redirect users to another web page based on their answers on a form, you can do it with "Change Thank You URL" conditional logic. 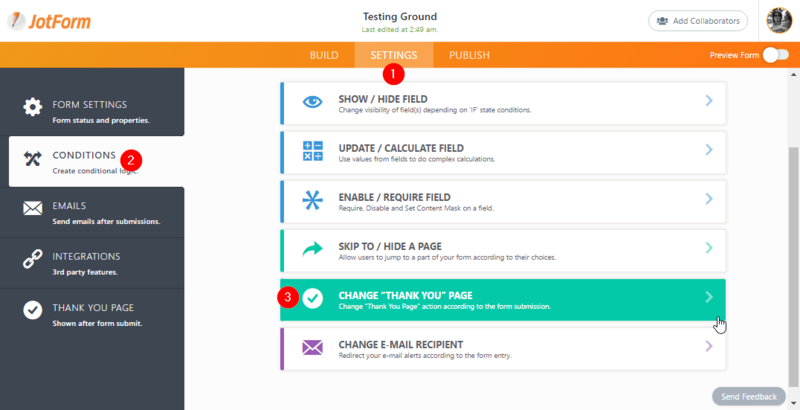 Here's how you set this up in the form builder. a. Click SETTINGS at the top. b. Click on CONDITIONS, select CHANGE THANK YOU PAGE > then proceed to STEP C below. 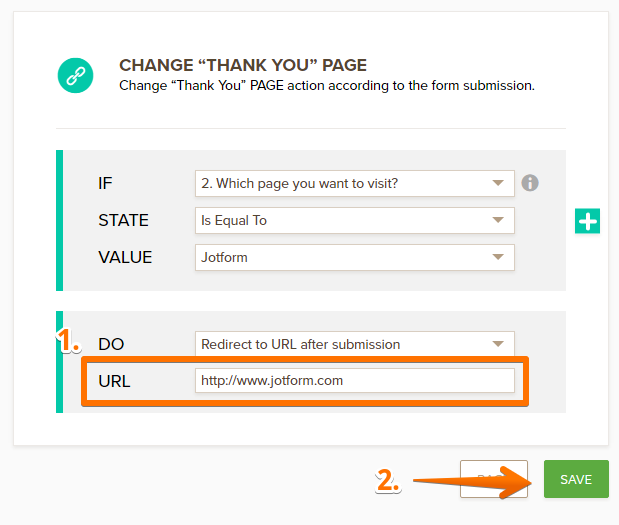 d. Now enter the URL to where you want the user to be redirected after submission. e. Save the form changes and that's it. If you have any questions about this method, please let us know by posting a comment below or by posting a question to our support forum. Your demo form is over quota. J'ai réussi à configurer deux conditions différentes pour envoyer vers deux url différentes après remerciement en fonction de l'entrée "adresse mail" de mon formulaire, mais rien y fait, dans les deux cas la redirection s'effectue vers le même site. I am trying to customize my Thank You page, however there is no Thank You page listed on the left bar when I go to Settings. Please let me know how I can get this to show up so I can then customize it. I faced the same issue when trying to redirect to a custom page upon condition. I solved this postfixing the url with .html. Hello, I have tried to set this up numerous time and my submission returns a blank page. I have embedded this code onto a Wix webpage per your instructions, the form comes up and operates correctly other than redirecting me to the desired URL. Can the conditional form have a background that is an image? Would love to see some examples of conditional forms in action. Thanks! I've tried to redirect to an other form using the Thank you page, but it directs to a blank page. ho il mio modulo e quando faccio per pubblicarlo il link non va .. come mai ? cosa devo fare? Is there a limit on how many Change Thank You page URL conditions we can have? It seems as though the instructions on this page are outdated. The "Conditions" no longer show the "change thank you URL" but rather it says "change thank you page." The new way is much better, but it's probably best to update your instructions. The demo form provided at the end of this help post seems to be blank. Hello Jotform I want both thank you page and redirect page within span of some time. Please help me and send me reply to venkataramana@bhavyatechnologies,com. It's very urgent. Is it possible to add in a PDF instead of a URL? How can I avoid that people select wrong dates?